Stilolinea offers different packaging solutions because it is aware of the importance of combining a quality product with a package that can enrich its value. 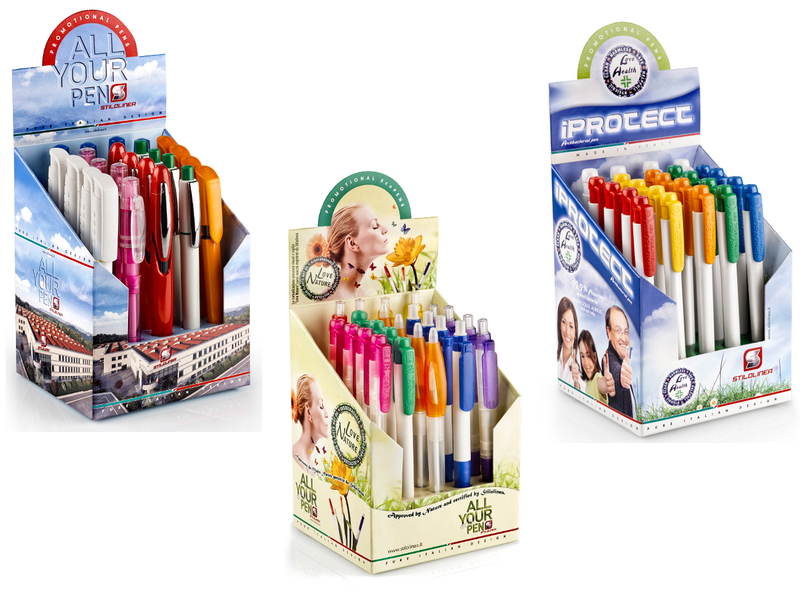 We provide not only a "pen with the logo", but a "communication project". The package gives the chance to increase the printing surface, thus adding more information about the new product that you are promoting or about the value of the gift you are giving away. You can choose among various types of materials: paper, polypropylene, transparent plastic. They are all customizable and some of them also on the cover. Dedicated cases: realized with graphics that reflect the plus of the relevant products. They are the cases for the eco-friendly, antibacterial and Myto lines. They are cheap cardboard boxes that show the main features of the product and provide a customizable area on the back of the pack where it is possible to add the company logo, the product to be promoted or the corporate message. Gift boxes: suitable for the complete Stilolinea top line Tethys and Myto. They are metal case with a transparent window on the top highlighting the product inside. 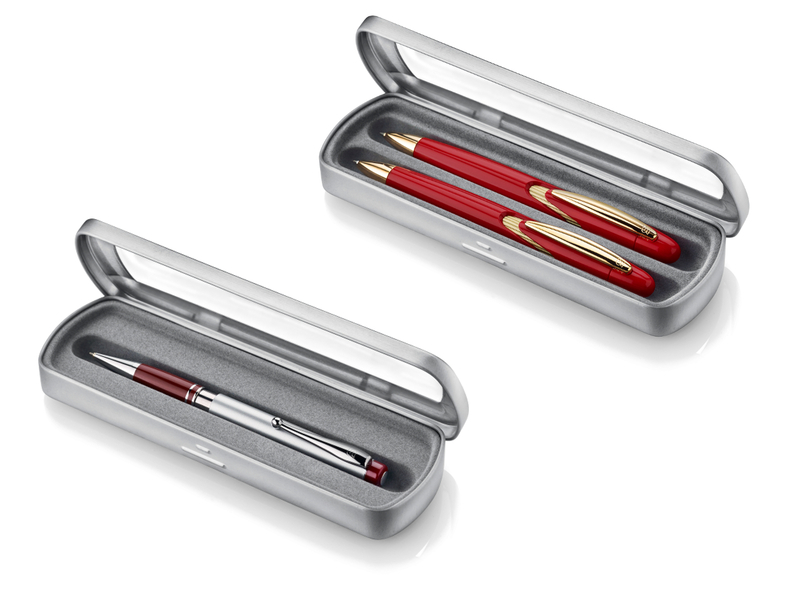 The inner housing can accommodate 1 or 2 items if you want a set pen + mechanical pencil. For Myto Speed line, which includes the roller and the fountain pen, there is a red box with a precious silver printing on the cover. The inner housing is covered with a fine white cloth where the single pen or the set are placed accompanied by instructions manual and warranty. Display 24 units: it facilitates the exposure and distribution of gadgets. It can contain 24 pens and emphasizes the prestige of the brand or convey a message through the customization of graphics. We have on stock the displays dedicated to the ecological and antibacterial lines which can join your own brand with a high awareness on issues such as health, prevention and attention to the environment. It can hold up to 40 pens packed with plastic wrap flow-pack. Suitable for deployment in sensitive environments such as pharmacies, hospitals, schools, government offices, industrial laboratories. The graphics is fully customizable. 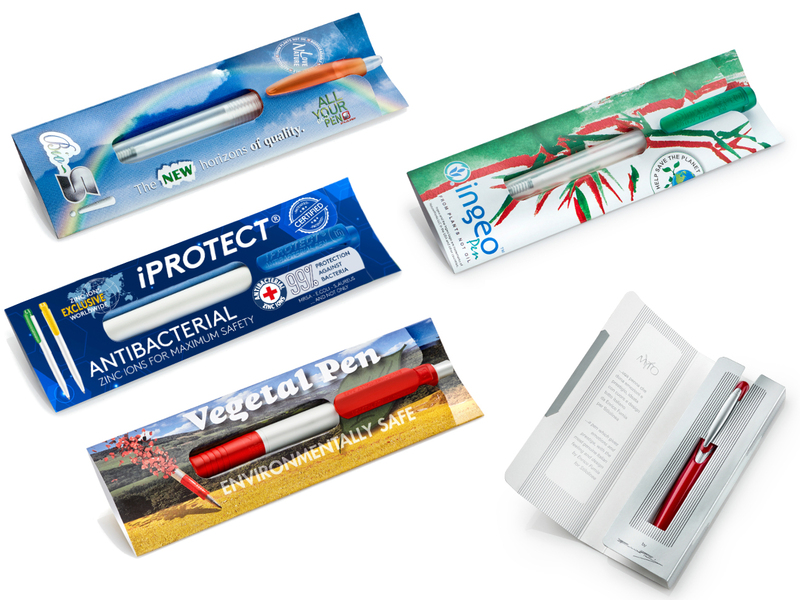 The standard version with iProtect graphics dedicated to the antibacterial pen is available on stock. An original package, very useful for the customer. 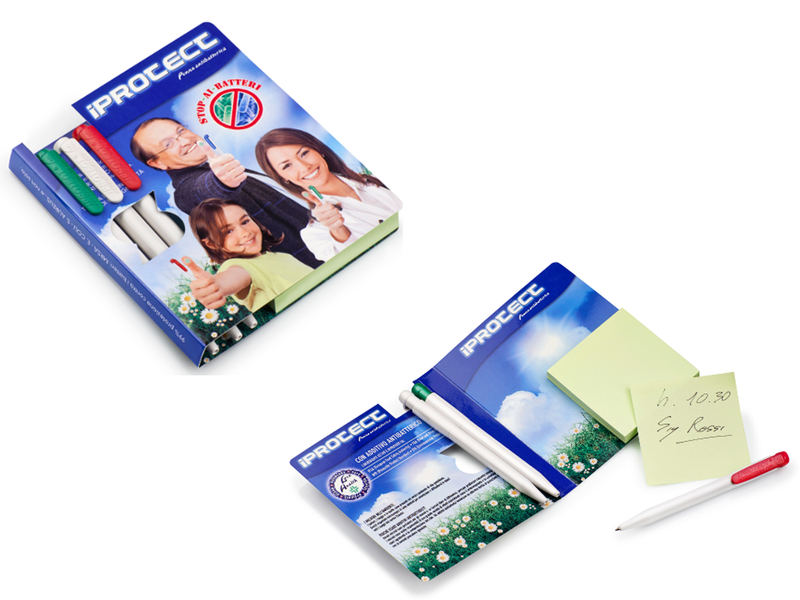 The pen is already a useful object (and inexpensive if compared to the number of prospects that develops), but, given together with a 100 sheets block post-it inserted in a customizable cover, it becomes a gadget of strong impact that will be appreciated by your customers. It is possible to add from 1 to 3 pens. 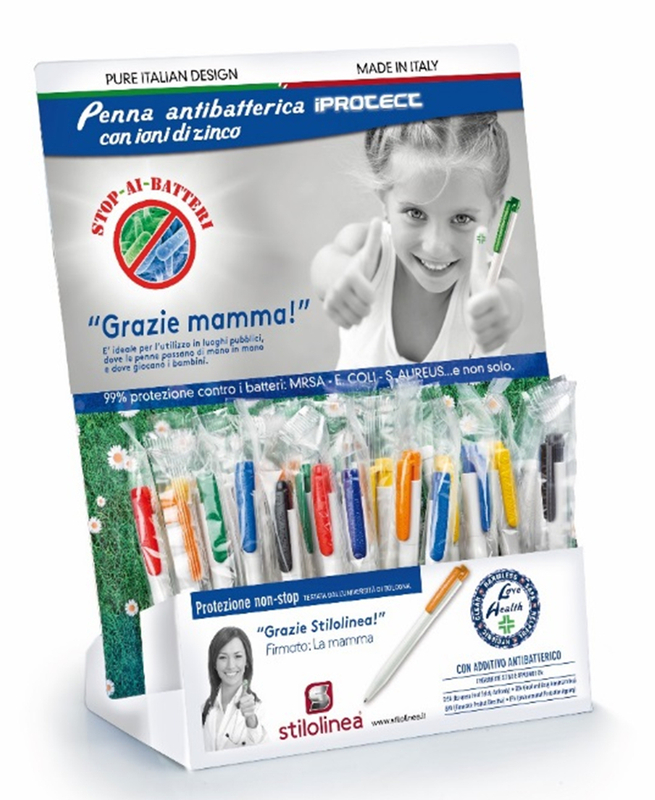 Available on stock the version for the antibacterial pen iProtect. 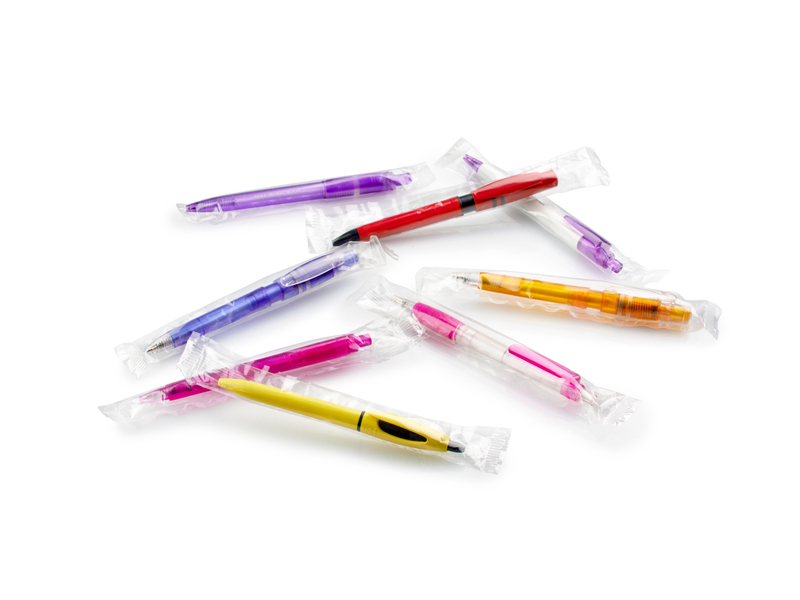 It allows to pack individually or in multipacks with a clear transparent wrap all Stilolinea pens. Ready to be delivered to the final customer. The duration of the refill is one of the most important features which enhances the quality of a writing article, but also its cheapness. This is why in Stilolinea the complete pen is subjected, at the end of the production process, to the test for the writing efficiency and only certificated inks are selected. In our warehouse different models of refills are always available: plastic tube, Jumbo, metal tube, etc... A gift pen can be also enhanced with the choice of a metal tube refill. In addition a pen can be also customized by choosing a particular ink color. To match the color of the ink with the colors of the pen or some of its parts? Stilolinea offers its products with standard blue ink refills. It is possible to require different colored inks: black, red and green for minimum quantities. For colors other than those described it is possible to evaluate the combination special with many models in our range. For different colors, it is possible to evaluate the special matching with several models of our range.